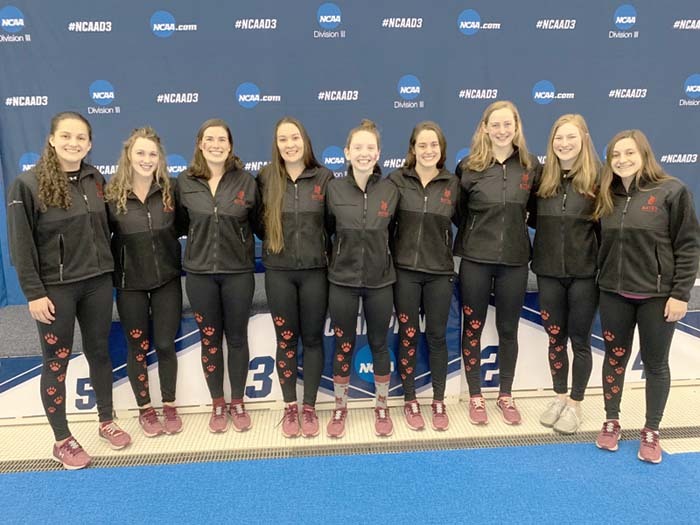 Over the course of March 20-23, nine members of the Bates Women’s Swimming and Diving team travelled to Greensboro, N.C. to compete in the NCAA DIII National Championships. For a small school like Bates, it can be intimidating travelling to competitions of such caliber. However, given the wealth of experience and familiarity that the Bobcats have with the national stage, it was just another meet. Overall, Bates finished 20th out of 50 scoring teams at nationals, marking the sixth year in a row that the women’s team has finished in the top 20 nationally. Additionally, the nine women who went to nationals earned 21 All-America honors combined. Day one featured the 200-yard medley relay, composed of Janika Ho ’20, Emmy Diagle ’20, Caroline Apathy ’21, and Suzy Ryckman ’22. In the trials, Bates finished seventh with a time of 1:44.04, qualifying them for the finals later that day. Ho’s opening 50-yard backstroke split of 26.19 set a new team record, eclipsing the previous mark of 26.22 set back in 2015. In the finals, Bates finished eighth with a time of 1:44.09, earning the group All-America honors. Day two held a bigger slate of events, with Apathy featured in the 100-yard butterfly, as well as the 200-yard freestyle relay and 400-yard medley relay. Apathy entered the meet as the top seed in the nation following her NESCAC-winning performance of 54.54, nearly a full 0.50 seconds faster than the next competitor in that race. In the preliminaries, Apathy swam 55.07, leaving her in sixth headed into the finals. The final was unbelievably competitive, with the difference between first and fifth just 0.33 seconds. Apathy touched the wall at exactly the same time as Washington & Lee’s Alison MacQueen, tying her for third, Bates’ best individual finish at nationals since 2016. Apathy’s performance earned her another All-America honor, her second in as many days. In the 200-yard freestyle relay, the Bobcats placed 13th, exceeding their seed of 22nd entering the meet. The preliminary and finals saw two slightly different teams, with Ho, Ryckman, Erin Bucki ’21, and Apathy swimming the preliminary race, followed with Ho, Ryckman, captain Lucy Faust ’19, and Apathy. The latter group secured a 13th place finish overall and another set of All-America honors for all five swimmers. Additionally, the Bates 400-yard medley relay finished 16th, earning All-America honors for the group composed of Isabel Mohammadi-Hull ’22, Diagle, Apathy, and Ho. Day three, while not as busy as the previous day, still provided some excellent moments. The 800-yard freestyle relay took home a tremendous eighth place finish with a team made up of Maya Reynoso Williams ’22, Bucki, Faust, and Caroline Sweeney ’22. Reynoso Williams and Sweeney took home their first All-America honors, making them the 28th and 29th members of Bates Women’s Swimming and Diving to do so. Day four was highlighted by Faust competing in her final collegiate event, as well as the 400-yard freestyle relay. While Faust didn’t manage to add to the two All-America honors she earned already, her teammates and coaches simply could not praise their captain enough for wrapping up her excellent career. Along with Faust’s excellent final performance, Bates had yet another relay earn All-America honors, with the 400-yard freestyle relay of Ho, Ryckman, Sweeney, and Apathy finishing 15th in a time of 3:28.27. While the group experienced incredibly high levels of success at NCAAs, everyone is still looking for more; Sweeney is already looking forward to next year. The accolades this group has earned is a strong testament to the incredible levels of effort that they have put in over the course of the season, and should absolutely not go unnoticed. On a Sunday afternoon in the historic Alumni Gym in Lewiston, Maine, the visiting University of New England (UNE) Nor’easters (2-3) took on the Bates Bobcats (2-0) in an exciting matchup. The teams were evenly matched throughout the game, taking an extra two periods of overtime to declare a winner.